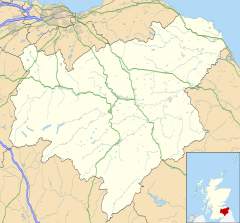 Galashiels (/ˌɡæləˈʃiːəlz/; Scots: Gallae, Scottish Gaelic: An Geal Àth) is a town in the Scottish Borders and historic county of Selkirkshire, on the Gala Water river. The name is often shortened to "Gala". The town's coat of arms shows two foxes reaching up to eat plums from a tree, and the motto is Sour Plums pronounced in Scots as soor plooms. This is a reference to an incident in 1337 when a raiding party of English soldiers were picking wild plums close to the town and were caught by Scots who came across them by chance and slaughtered them all. On a hillside to the north of the town, Buckholm Tower is a prominent structure which dates back to 1582 and replaced an earlier tower built on the same site but destroyed around 1570. 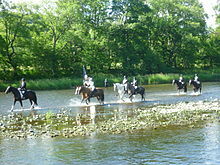 In 1599 Galashiels received its burgh Charter, an event celebrated every summer since the 1930s by the "Braw Lads Gathering", with riders on horseback parading through the town. The Paton Street drill hall was completed in the late 19th century. Galashiels' population grew fast through the textile trade with several mills. A connection with the town's mill history, the Mill Lade, still links the town from near the site of mills at Wheatlands Road, to Netherdale, via Wilderhaugh, Bank Street, the Fountain and next to the Tesco/retail development Street. 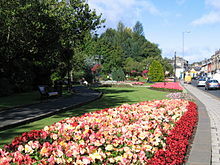 Galashiels has an oceanic climate. However due to its elevated position and distance from the sea it has colder winters and slightly warmer summers than coastal places such as Edinburgh, Dunbar and Eyemouth. Snow is also much more common in winter, and covers the ground for an average of 38 days a year in an average winter. Robert Burns wrote two poems about Galashiels, "Sae Fair Her Hair" and "Braw Lads". The latter is sung by some of the townsfolk each year at the Braw Lads Gathering. Sir Walter Scott built his home, Abbotsford, just across the River Tweed from Galashiels. The Sir Walter Scott Way, a long-distance path from Moffat to Cockburnspath, passes through Galashiels. There is some largely good-hearted rivalry between some of the Galashiels townsfolk and those of other border towns, particularly Hawick, the next largest town in the Scottish Borders. 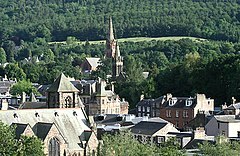 Galashiels' citizens often refer to their rival as dirty Hawick while the 'Teries' retort that Galashiels's residents are pail merks, supposedly because their town was the last to be plumbed into the mains water system and so residents had to rely on buckets as toilets. Galashiels was also home to the author of the famous Scottish song, "Coulters Candy". Robert Coltart was a weaver in the town, but also made confectionery in nearby Melrose. The song was created as an advertisement, and hence was renamed as "Sugar Candy" when played by the BBC. The song is possibly better known by the first line of its chorus - "Ally, bally, ally bally bee". Coltart died in 1890. The 1985 Marillion hit single Kayleigh was partially inspired by events that took place in Galashiels as the band's lead singer Fish spent some time in the town in his earlier years. In 2012 the Scottish Borders Council undertook work to revamp the Market Square with lyrics of the song inscribed into the paving slabs. Fish officially reopened the square on completion later that year. In 1969, the historic Waverley Line which connected the Scottish Borders to the national rail network was closed as part of a wider series of cuts to British Railways. The closure led to a campaign for a return of rail to the region that never diminished. Following years of campaigning, in 2006, the Waverley Railway (Scotland) Act was passed by the Scottish Parliament, which authorised a partial restoration of the service. The new Borders Railway, which links Galashiels with Edinburgh, saw four new stations built in Midlothian and three in the Scottish Borders. For most of the route the original line was followed with 30 miles (50 kilometres) of new railway line built. The project is currently estimated to cost £294 million and was completed in September 2015, with the formal opening on 9 September by the Queen. Trains from Galashiels railway station run every half-hour going down to hourly in the evening and on Sundays. Journey times between Tweedbank and Edinburgh take less than one hour. The town also has a recently opened Interchange building which replaces the old bus station, and is also situated next to the railway station. It has a café, allowing travelers and commuters to relax prior to their bus or train journey, and upstairs has office space which can be leased to businesses and organizations. It also has full toilet and baby changing facilities, and a travel helpdesk. The following are listed by Scottish Borders Council as being in the Galashiels area and are catchment schools for Galashiels Academy. Netherdale in Galashiels is home to Heriot-Watt University's School of Textiles and Design, which is also a shared campus of Borders College. Despite the town's relatively low population, the early 2000s saw many new developments, including Asda, Boots pharmacy, Halfords, Marks & Spencer, Matalan, McDonald's, Next, Subway fast-food outlet and Tesco Extra. Most of these are on former mill and industrial estate sites, while other disused mills have been converted to living accommodation. The town is home to the Glasite church, in danger of being lost, but still standing sandwiched between mills and shop buildings on High Street, Botany Lane and Roxburgh Street. Netherdale is home to Gala RFC and Gala Fairydean Rovers, with the football and rugby stadiums adjoining each other at one end. The football club's main stand was built in 1963 to designs by Peter Womersley, based in nearby Gattonside. The cantilevered concrete structure, in the Brutalist style, is now protected as a Category A listed building. Located in the south west of the town on Meigle Hill. Mainly ex-local authority houses. Served by Balmoral Primary School. Balmoral connects with Windyknowe and Gala Park where there are some stone built properties dating from the Victorian era as well as private housing from the 70s and 80s near to the Victoria Park. Built on both sides of Melrose Road to the east of the town and north of the Gala Water and River Tweed. Consists of ex-local authority homes and a handful of older, stone-built properties along the Melrose Road. Sits high up the hill as you leave Galashiels on the A7 towards Edinburgh at the north-west of the town. Consists of two large streets (Halliburton Place and Glendinning Terrace) that run parallel with Magdala Terrace and further on Bristol Terrace, which make up part of the A7. Neighbouring Halliburton, Ladhope, comprising homes from the past four decades, stretches high up on the hillside, largely connecting Halliburton to the High Road, Melrose Road area of Galashiels. It is also home to Galashiels Golf Club and Heatheryetts grave yard. Torwoodlee and Kilnknowe are in the north west of the town. The main street running through this area is Wood Street, and is part of the A72, that carries on to Clovenfords, Innerleithen and Peebles. Kilnknowe Place, Balnakiel Terrace, Torwoodlee Road, Pringle Lane and Blynlee Lane, mainly ex-local authority houses from the 1970s, are streets in this area. In the east of the town, Netherdale is home to Gala RFC and Gala Fairydean Rovers F.C.. The Scottish Borders campus of Heriot-Watt University is located here also. Netherdale is a possible location for one of the two new primary schools needing built in Galashiels due to the town expanding. Netherdale is also home to the 'Raid Stane' (Raid Stone). This stone marks the site of skirmish between the residents of Galashiels and English raiders during the Scottish wars of independence. The stone is marked by a small sign, located on the lawn next to Netherdale car park. The area most vehicles pass through; Kingsknowes is in the extreme south of Galashiels. The A7 from Selkirk enters from the south-west up to Kingsknowes roundabout before heading north-west into Galashiels. The A6091 starts here and heads east past Tweedbank, Darnick, Melrose and Newstead to the A68. This is the preferred route from Carlisle to Edinburgh as the A7 loses its Trunk Road status here. Now a mixture of housing and a busy thoroughfare through town, this part of Galashiels has a market or mercat cross and is surrounded by remnants of the town's history, with a former cloth hall, the Gala Aisle, and Tea Street in the neighbouring area. Tweedbank is south of Galashiels, centred around Gunknowe Loch, also known as Tweedbank Pond. There is a small late shop, a primary school, a community centre - used for scouts, guides, rainbows etc. - and the newest addition to Tweedbank is a bar and restaurant located next to the loch. Tweedbank also has an industrial estate and is home to radio station, Radio Borders. The town is also the terminus of the Borders Railway. Although now technically separate, Tweedbank's population is often lumped in with Galashiels, with a total area population of 14361 recorded in the 2001 census. This particular geographical formerly linked Langlee and Tweedbank to the town centre. It has been replaced when The Borders Railway which has been rebuilt and now currently has the Scotrail service from Tweedbank to Edinburgh running over it. A section of the Black Path links to the Southern Upland Way. Other areas not listed include Windyknowe, between Galapark and Wood Street, and Glenfield/Langhaugh between the town centre and Langlee where housing developments have seen these places expand in recent years. Both have elderly residential homes complexes. Not formally part of one area or another, there are also streets of former mill terraces just off the town centre, including at St John Street, Gala Park and Scott Street. These link with parts of the Old Town and bear similarities here with blocks of flats dating from the 1960s and 70s evident among the terraces. Also away from town are places such as Duke Street, King Street and Union Street where again, mill terraces dominate but their former associated workplaces have long since been demolished to be replaced with modern retail or business units. Duke Street almost stands alone but was once connected to Wilderhaugh with terraced rows such as Queen Street once forming an almost unbroken link. There are also 1960s/70s flats mixed with terraces around Netherdale, including at Dale Street and Greenbank Street. Johnny Davidson, subject of QED documentary. ^ "Scots Language - Names in Scots - Places in Scotland". ^ "An Stòr-dàta Briathrachais". smo.uhi.ac.uk. Retrieved January 21, 2010. ^ "Galashiels and District - Overview of Population, Deprivation, Unemployment and Schools" (PDF). Scottish Borders Council. Archived from the original (PDF) on 30 June 2018. Retrieved 30 June 2018. ^ John Ruskin (1907). The Works of John Ruskin. Longmans, Green and Co. p. 613. ^ "Ploom n." Dictionary of the Scots Language. Retrieved 2019-01-23. ^ "Galashiels, Paton Street, Mid Mill". Canmore. Retrieved 13 June 2017. ^ "Galashiels climate averages". Met Office. Retrieved 17 October 2015. ^ "Queen officially opens Borders-to-Edinburgh railway". BBC. 9 September 2015. Retrieved 11 September 2015. ^ "Glasite Chapel (Former), Botany Lane, Galashiels". ^ "Gala Fairydean Rovers stand upgraded to A-listed". The Scotsman. Johnston Publishing. 2 December 2013. Retrieved 2 December 2013. ^ "Travelling to the Campus". scottishborderscampus.ac.uk. Retrieved 8 June 2013. ^ "2001 Census". Archived from the original on 2012-03-22. ^ "Fellows of the Royal Society". ^ "Sandy McDade at IMDB". ^ "Johnny Mains is Dead Funny". "Census 2001". Population figures. Archived from the original on September 14, 2005. Retrieved August 17, 2005. "BBC Voices Recording/Scottish Corpus". Retrieved January 4, 2009. "Waverley Rail Project". Rail work figures. Retrieved October 2, 2009. 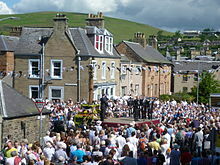 Wikimedia Commons has media related to Galashiels.